Pretty the setup maybe, but ugly the result was. Despite the better-than-expected U.K. retail sales report, GBP/USD still ended up falling and breaking through significant Fib levels and the rising trend line. Risk aversion seemed to be the dominating market theme as weekly jobless claims and U.S. earnings reports disappointed. I think this is probably the lowest point in my trading carreer… I haven’t won a single trade in quite a while and I am thinking of just hanging in the towel. Ugh! But… I must persist. There will always be low points and it’s just a matter of getting back up and persisting. Let us see if Q4 will be kinder to me. I’ve been contemplating to go long at market, but I think a little patience can get me in at a better price. After all, price seems to be pulling back to some major Fibonacci retracement levels and the rising trend line support. That being said, I’m planning to buy once price tests the area between the 38.2% and 50.0% Fibonacci retracement levels. To avoid missing the move, I’ll most likely scale in and put in two positions: one at the 38.2% level and the other at the 50.0% level. As for my stop and profit target, I’ll correspondingly place them below the falling trend line and at the previous high. I think the fundamentals line up nicely with my trade idea too! Yesterday, the claimant count change report for August showed that the number of people who filed for unemployment benefits dropped by 4,000 during the month and topped expectations which was for a measly decline of 200. On top of that, the BOE meeting minutes revealed that the central bank MIGHT not follow the footsteps of its counterparts in launching more QE after its asset purchase program expires in November. It seems like members of the MPC are still divided on whether or not they should extend their asset purchase program. With that said, I think that we would continue to see the pound trade higher given that further quantitative easing is still not a done from the BOE. 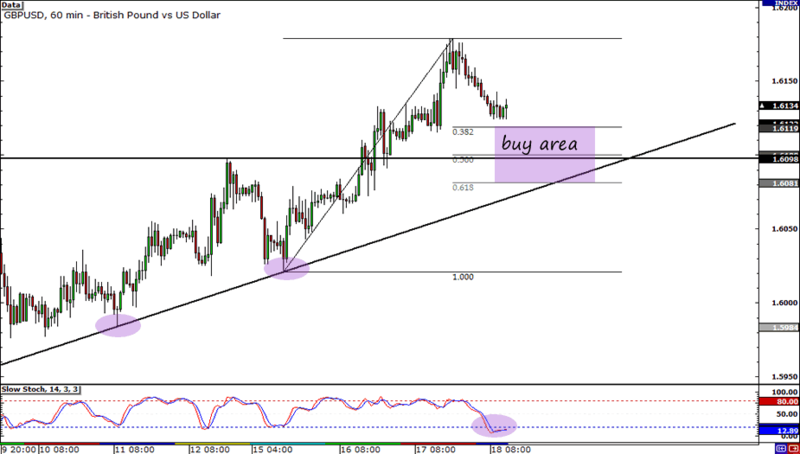 Long at 1.6120 and 1.6100. 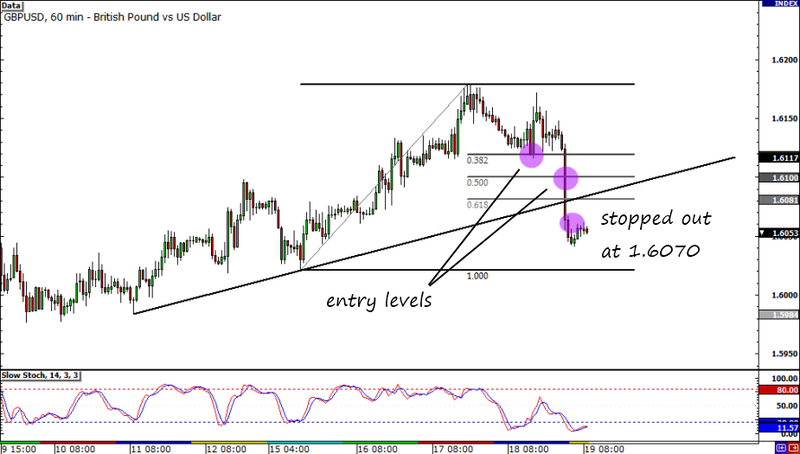 Stop loss at 1.6070. PT at 1.6180. I will risk 1% of my account. Risk disclosure.